Corfu Town is one of the most elegant island capitals in Greece and administrative and commercial center of the island. Although many of the buildings were bombed by the Nazis during World War II, several sights remained intact, such as the two Venetian fortresses and the church of St. Spyridon of the 16th century. The strategic location of Corfu at the entrance of the Adriatic Sea, early on had the island play an important role in the plot of Mediterranean history. From the first moment, Corfu claimed a leading role in the political history of Europe. The city became Macedonian, Roman, Byzantine, Venetian, French, British and Greek, while retaining each time the uniqueness of every culture throughout the centuries. During each of these phases, different cultures coexisted while the visitor immediately recognizes that the past and present of the city urges him to discover all these unique elements. 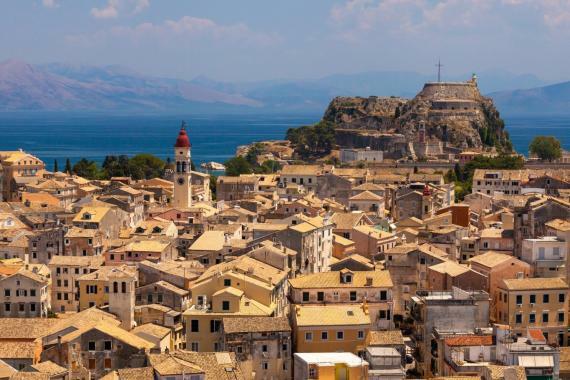 Today, the old town of Corfu embraces at least 7,200 inhabitants and is the "historical center" of a larger area that includes 28,185 residents, stretching both inland and to the south and west. Undoubtedly, the city of Corfu remains an international tourist destination with tourists being drawn to the island by its unique beauty throughout the year. The town of Corfu includes different areas with the picturesque old town with alleyways and cobbled streets, about which many songs have been written, leaving no visitor untouched. It remains its unique atmosphere while the new city has a clear urban character and has adapted itself to the times. Without a doubt, the first thing you'll perceived is the mixture of medieval and Venetian architecture that embraces the entire city. In the historical center one can find a plethora of attractions. The two Venetian fortresses not only empress you with their majestic presence. One of them still hosts concerts and theatrical performances during the summer months. The "Spianada" is the largest square in Corfu and the Balkans while the famous "Liston", a special road in the city center impresses with its unique arches. Going for a first walk in the city, you'll encounter the church of St. Spyridon, patron saint of the island. It's characterized by a large bell tower. You should also visit the grave of Ioannis Kapodistrias, the first governor of Free Greece. Definitely, you shouldn't miss to visit the Dionysios Solomos monument and the hidden museum of the poet that was born in Zakynthos and wrote the Hymn to Liberty, which was to become the national anthem. Note that the writer of the national anthem studied at the Ionian Academy and lived in a small Corfiot house most of his life. Close to Corfu Town, you'll find the Achillion, the summer residence of Empress Elizabeth of Austria. If you wonder where the palace took its name from, take a look at the majestic statue of the dying Achilles that adorns the garden. Mon Repos, the former royal summer palace, is another interesting sight to visit as well as "Pontikonisi", the Mouse Island, that remains a symbol of Corfu until today. Also don't miss the City Hall and the Archaeological Museum and a number of other museums, like the Asian Art Museum that mirror the many cultures that passed by the island. Take a stroll through the city and pass by the Philharmonics of Corfu, the Plati Kantouni, the Kampielo and the Ionian Academy. The uniqueness of the island's architecture will amaze you in a surprising way. Find information about selected Hotels, apartments and rooms in Corfu Town to choose the perfect place for your accommodation.